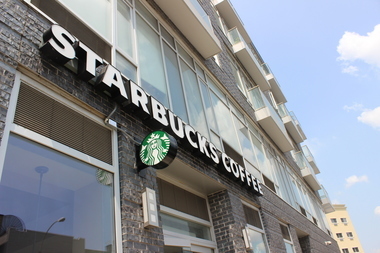 Williamsburg's first Starbucks is located at 405-409 Union Ave.
WILLIAMSBURG — Starbucks has not been clear enough about its plans for a second Williamsburg location — including leaving the mega-chain's name off its notice announcing a request for a liquor license — and needs to do more local outreach before it can proceed, the local community board said. Community Board 1 decided to postpone voting on the coffee chain's request for a liquor license at its new location at 154 N. Seventh St. after a committee thought it was not being transparent enough about being a Starbucks. A flyer posted to notify residents of the liquor license application noted that Starbucks-affiliated company Coffee House Holdings is requesting a beer and wine liquor license to open a "coffeehouse" — without the word Starbucks in sight, said Rob Solano, a member of CB1's State Liquor Authority Review Committee. Neighbors have "a natural affinity for local business," and they deserve to have a broader conversation about approving the chain's liquor license, he said. "If you walked by, you wouldn't know it was Starbucks," Solano said. "It had a local business feel." Starbucks has a liquor license in one other location in the city, but it's a "stealth" version of the ubiquitous shop that doesn't use the company's name. The liquor license for that shop, called Herald Square Cafe in Macy's, 151 W. 34th St., went into effect last summer. A Starbucks spokeswoman did not immediately respond to a request for comment. It was not clear if the new Williamsburg location is meant to carry the Starbucks name. At Wednesday's meeting, the SLA Review Committee requested that the company post proper signage naming Starbucks as the company seeking a liquor license, Solano said. It also asked that Starbucks do outreach to people living near the new location to let them know about the license request. The full community board approved the postponement of the liquor license vote Wednesday night, and Starbucks will go in front of the SLA Review committee again next month. The community board's vote is advisory to the SLA, which will make the final ruling on the license. When Starbucks opened its first location in Williamsburg, some patrons said they felt "weird" about the corporate chain moving in. But Solano said the SLA Review Committee wasn't inherently opposed to the business. "We're open-minded," Solano said. "We just want to make sure the community is aware of it."